If you’ve already got a bespoke limousine in the garage and a superyacht docked down at your local port then we’ve just found the next addition to your luxury transport fleet: an Airbus ACJ319 with a cabin by Pagani Automobili. Yes, that’s the same Pagani who built the revered Zonda. 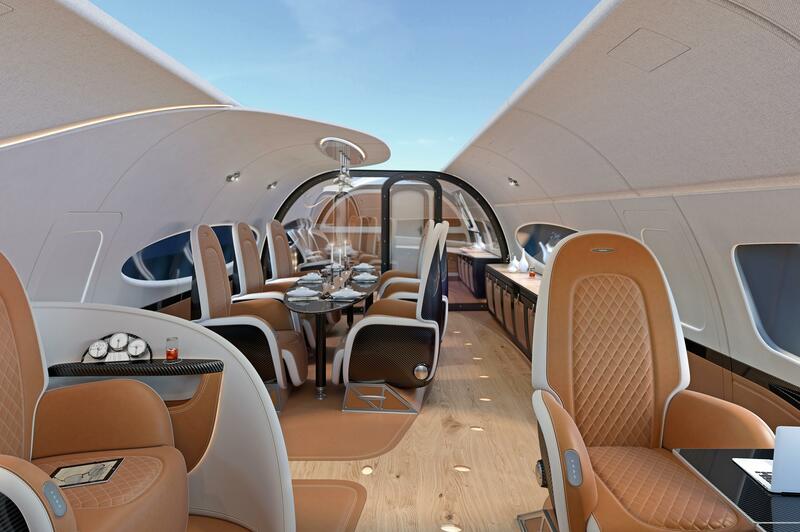 Teaming up with the commercial jet arm of Airbus, the Italian supercar manufacturer has created the Infinito cabin, so named because of its incredible sky ceiling. Yes, this a private jet with a panoramic glass roof. As you’d expect from a Pagani creation, the Infinito cabin comes with gorgeous quilt-stitch leather seats, a wooden floor and carbon fibre wall frames and cupboards, perfecting for storing your favourite in-flight tipples. Glass dividers between the lounge and conference spaces can be switched from transparent to opaque at the touch of a button, while the curved design language throughout the Airbus x Pagani Infinito cabin is said to be inspired by nature’s own shapes. Tempted? The Infinito cabin can be kitted out in the ACJ319, the commercial version of the twin-engined Airbus A319, capable of flying eight people in style for around 15 hours (or 12,500 kilometres).